Location: In the centre of the circular rose garden at the south end of Victoria Park. Early C20, probably 1908. This pattern was manufactured by Macfarlanes of Glasgow. 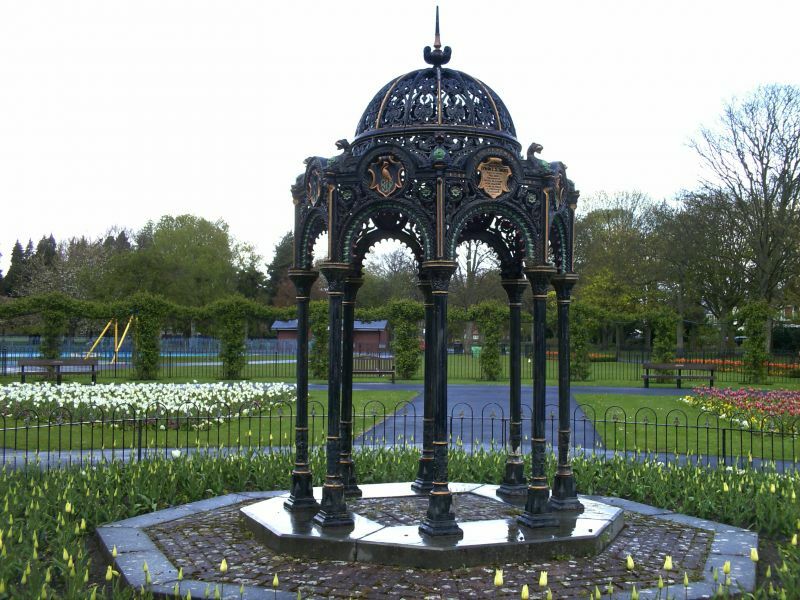 The fountain was in working order with the canopy freshly painted when listed in 1975, but the canopy has been refurbished without the drinking fountain, probably in the 1990s when it was resited in the centre of the flower garden from its original position by the lake. Complexly detailed cast iron canopy originally over a drinking fountain. Octagonal canopy supported on slender cast iron columns with enriched caps, arches, spandrels, medallions containing relief birds, and with other birds above. The whole is covered by a small, decoratively pierced dome topped by a spike finial. Inscription reads 'In Memoriam Lewin L Samuel. Aged 39 years. Died 1893. Presented to the City of Cardiff in the year 1908 by his brothers in affectionate rememberance'. This drinking fountain canopy is to the same pattern as the canopy over the fountain in Bute Place, Butetown. Included as a fine piece of Victorian cast iron design and manufacture. In the centre of Canton Community about 700m west of Canton Cross. On the north-west side of Canton by the junction with Pencisely Road. On the north side of Fairwater Conservative Club (Ely Rise). On the north side of Cowbridge Road on the railway bridge spanning the Cardiff-Swansea line. The milepost is situated just to the west of the junction with Pen-y-peel Road.